My apologies for being late in posting this. I was in the Ottawa area over the weekend for my cousin's wedding so I didn't get a chance to post this on Friday! 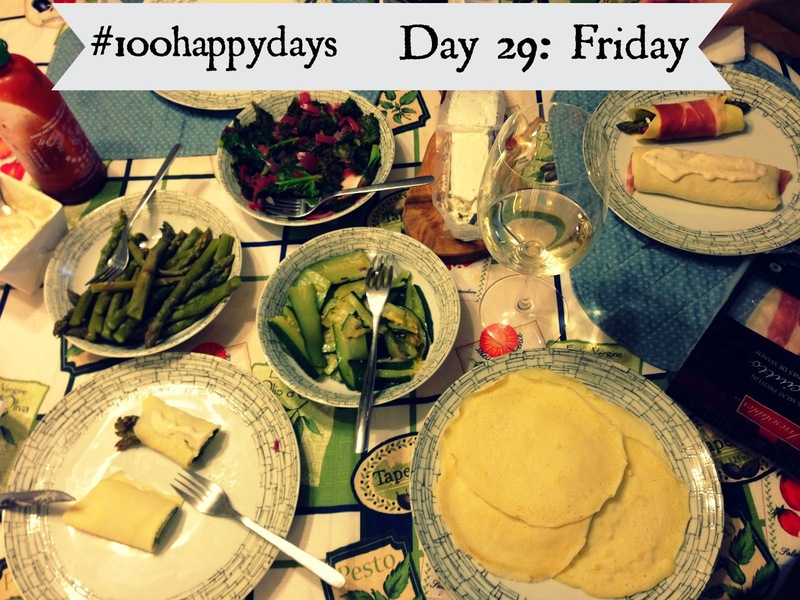 But the 100 Happy Days challenge continues with days 29 - 35 in Week 5. My best friend and her husband came over for dinner. I blatantly stole the idea from our friends who had us over for dinner last week and made crepes. Gluten free crepes! That post to come. It was delicious and a fun evening spent catching up. Dinner at my parents' place to celebrate my sister's graduation from her Recreation Therapy program. We may drive each other crazy but we stick together in hard times. I spent a bit of time with my mom shopping and scored these new running shoes from Winner's for $49.99! If that doesn't make someone happy I don't know what could. After running home from work, post night shift, in my new shoes, I was happy to snuggle into bed with this bug. She's too cute for words sometimes. Nerd night + husband + glass of merlot = happiness. The cutest selfie I've ever seen. Someone's beard is really coming in. Sorry John, looks like Reese has you beat. The weather was warm and wonderful and the water in the stream was low. I waded out into the middle in my rainboots and the pup followed. She is normally very hesitant around water so watching her first few timid steps turn into comfortable strides was awesome. She'll be a water dog yet!